I try to follow a useful rule when shopping at garage sales: if you see something you like, pick it up and hold onto it. I've learned the wisdom of this practice by losing out on a few good items due to indecision. 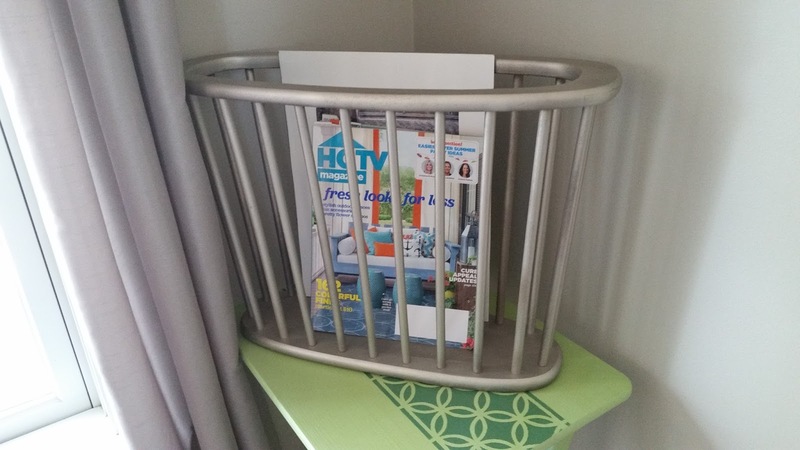 This summer, in fact, I found a terrific metal magazine rack on sale for one dollar, but I waffled on the purchase. Do I need a magazine rack? Where would I put it? By the time I decided that I'd love the magazine rack and mentally designated the perfect place for it in my house (The. Perfect. Place. ), the magazine rack was gone. I mulled over that rack for the rest of the day. I searched for magazine racks on Google and found one that looked exactly like the one I had passed up. It was selling for $29. Snap. Ah, you never quite get over the one that got away. I must tell you that it didn't come looking quite this nice. When I found it at another garage sale weeks later, it was dirty, missing three spindles, and relegated to the free pile because of its condition. Free? I'll take free. I'm all about free! While a small part of me still mourned the original metal rack that I could have gotten, my DIY sensibility appreciated the chance to salvage an object that others found worthless. It was time give that poor cast-off wooden rack a little love. I bought two dowel rods at Lowes, cut them to size with a hand saw, and lightly filed the edges until the rods easily slid into the pre-drilled holes on the rack's base and upper lip. Once the missing rods were inserted, I sanded the entire rack with a fine sandpaper, removed all traces of dust, and finished with several light coats of brushed nickel spray paint, the same finish I used for my recent picture frame upgrade. Not only do I love that I saved it from a dumpster, but I also love how it looks! The best part, though, just might be that once the project was finished, I didn't have to think twice about where to put it. I already had picked the perfect spot. TOTALLY buy yourself of brushed nickel spray paint. It's remarkably versatile. 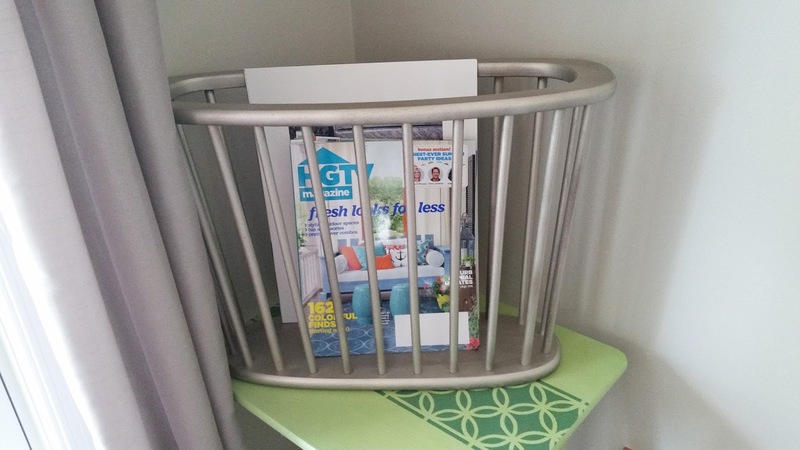 Glad you liked the magazine rack, Chris!